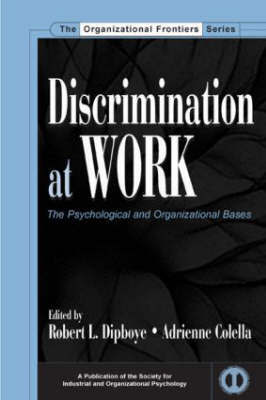 This volume brings together top scholars in industrial and organizational psychology with social psychologists to explore the research and theory relating to various areas of workplace discrimination. Many of the contributors to this book participated in a conference on workplace discrimination held at Rice University in May 2000. The idea came from the realization that there had been no attempt to bring together the various literatures on the topic. Discrimination and issues of employment diversity are significant topics today in IO psychology, business, and human resource management. how to explain discrimination in organizations;understanding discrimination against specific groups; andimplications for practical efforts to reduce discrimination. This book brings together, in one volume, a review of the research on discrimination based on race, age, sexual orientation, gender, physical appearance, disability, and personality. In addition, it explores the multilevel antecedents and potential bases for a general model of discrimination in the workplace. While social psychological research and theory have provided invaluable insights, an understanding of discrimination in the workplace and solutions will require incorporating factors at the organizational level in addition to factors at the individual and group levels. Although a definitive model is not reached, the aim of this text is to facilitate future research and theory.